At last Sunday’s Minnesota Varsity Showcase Concert, seven accomplished young performers and composers took to the Fitz stage to share their artistry with an enthusiastic audience in the hall and a live statewide radio audience. One of these amazing young musicians will perform again this and next weekend. Sunday, May 8, at Hamline’s Sundin Hall, and next Friday, May 13, at Dayton Avenue Presbyterian Church, 18-year-old cellist Mark Prihodko of Faribault, Minn., will be joined by pianist Miryana Moteva — together known as Nouveau Duo — for programs of Beethoven, Debussy, Schumann, and Popper. Sunday’s concert details can be found here; next Friday’s here. You can also hear last Sunday’s concert here. Mr. Prihodko recently learned that he was accepted at the Juilliard School and plans to attend there this fall. ‘Good Friday In Jerusalem’ by Cappella Romana. Good Friday in Jerusalem — a new CD from the male singers of Portland, Ore., choir Cappella Romana — hit Number 1 three days in a row last week on Amazon’s Hot 100 Classical bestsellers, and the album is now charting on Billboard’s national Classical chart at No. 8. Sung entirely in Byzantine chant, the recording recreates a Good Friday service as it might have been celebrated in 10th-century Jerusalem. The choir and three cantors trace the Passion narrative with breathtaking solemnity and power. Their mastery of the liturgies’ ancient musical language transports contemporary Western listeners to a vastly different time and place while fathoming the still-familiar accounts of Holy Week. Good Friday in Jerusalem was produced Classical MPR’s own Steve Barnett, who for two-and-a-half decades served as the chief music producer for the Peabody Award-winning series Saint Paul Sunday. Barnett is a three-time Grammy Award winner for his recordings with Chanticleer and is currently on staff at MPR to preserve and repurpose MPR’s and APM’s deep musical archive. “All music was once new,” goes the sign off each day for The Composers Datebook. Maybe that’s self-evident, yet to fans of classical music, it can still sound a little startling. We cherish classical music in large part for its timelessness — the capacity to speak across generations and centuries. At best, its power is at once enduring and time-specific, universal and personal. But if great music tunes us in to the eternal, it’s still grounded in the time and place of its original creation, the moment of its being “once new.” It’s easy to forget, as we return again and again to our favorite masterworks, that classical music (broadly defined) is a living art form, not only because centuries-old works continue to invite exhilarating new interpretations, but as importantly because it continues to incorporate the present-day works of living composers. Intended for music lovers of all stripes, Composer Conversations is an informal sit-down with some of our time’s best emerging and established living composers, and some of the artists who perform their music. Now in its third year and hosted by Top Score‘s Emily Reese, the series explores its guests’ inspirations, artistic history, and current projects, offering a glimpse into the processes and people behind the compositions. The 2015 Composer Conversations will welcome Kevin Puts (Feb. 18); Bryce Dessner with special guests Carolyn Shaw and Richard Reed Perry (April 2); Fred Lerdahl (April 22); and Missy Mazzoli (May 8). All conversations take place at the Amsterdam Bar & Hall in downtown St. Paul. Tickets are free, but reservations are required. Past Composer Conversations guests include Laurie Anderson, Maria Schneider, John Luther Adams, Shawn Jaeger, Nicola Campogrande, John Harbison, Sufjan Stevens, Vivian Fung, Timo Andres, Gabriel Kahane, and Dawn Upshaw. Knut Nystedt, who passed away this week at the age of 99, left a lasting mark on the world of music. Meanwhile, Nystedt’s grandson, Håkon Daniel Nystedt, continues his grandfather’s legacy as conductor of the Oslo Chamber Choir (Oslo Kammerkor). 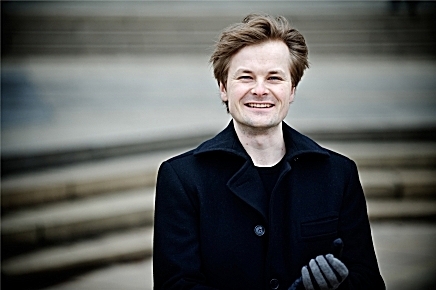 One of the most beautiful works on the choir’s 2012 CD Strid (“Struggle”) is Håkon Daniel Nystedt’s own arrangement of The Bridal March of Myllarguten.